Bond metal and plastic parts together without the need for glues, adhesives or additional heating or processes; distinct advantages over other bonding processes. The basic principle of ultrasonic assembly involves conversion of high-frequency electrical energy to high-frequency mechanical energy in the form of reciprocating longitudinal motion which, when applied to a thermoplastic, generates frictional heat at the plastic/plastic or plastic/metal interface. In ultrasonic insertion, a metal insert is placed in a cored or drilled hole which is slightly smaller than the insert. This hole provides a certain degree of interference and also serves to guide the insert into place. The vibrating ultrasonic horn contacts the insert and the ultrasonic vibrations travel through the insert to the interface of the metal and plastic. Heat, generated by the insert vibrating against the plastic, causes the plastic to melt, and as the horn advances, the insert is imbedded into the component. The molten plastic flows into the serrations, flutes, or undercuts of the insert and, when the vibrations terminate, the plastic resolidifies and the insert is securely encapsulated in place. In ultrasonic insertion, a slow horn approach, allowing the horn to develop a homogeneous melt phase, is preferable to “pressing” the insert. 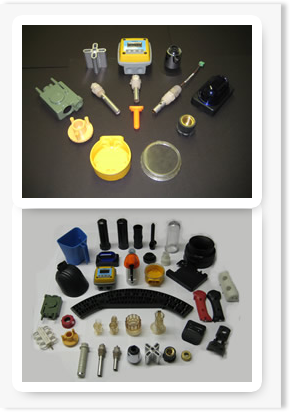 Ultrasonic insertion provides the high performance strength values of a molded-in insert while retaining all of the advantages of post-molded installation. Inserts can be ultrasonically installed in most thermoplastics. 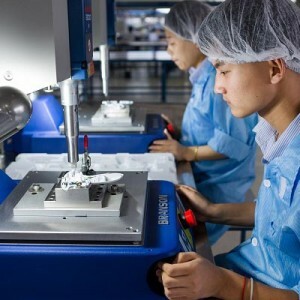 Some of the advantages of ultrasonic inserting over other methods include rapid installation, minimal residual stresses in the component following insertion, elimination of potential mold damage, reduced mold fabrication costs and increased productivity as a result of reduced mold cycle times. In some applications, multiple inserts can be imbedded simultaneously with special horns, increasing productivity and further reducing assembly and manufacturing costs.